Doll's Musings: IHSW and Some Finishing!! My weekend of stitching was not too shabby! Although I was busy, I did get some time at night to stitch on Jane. I managed to finish two pieces too and prep for more finishing for next weekend! Jane....just the snake and 1 over 1 verse to complete! I'm getting so close! Plum Street Samplers "Coffee Bean Christmas Tree" I didn't have the rusted bells but I think these turned out nicely. The green gingham I used for the backing. I finally finished Le Chalet des Perelles using that perle cotton stuff and some pretty silk ribbon from Vicki Clayton. While I was working on my smalls, look what the mailman brought me!! My first Prairie Schooler Chart!! Woohoo!! Although I'm a wee bit late getting this, it'll be great to stitch more fall designs for next year. Now I am trying to choose some cute Christmas ornies to stitch. Thank you all for your suggestions on getting "gray" linen. I'm going to try both Zweigart and WDW and see what I end up with. If neither are gray, I may just have to do some dyeing of my own! Hope you all had a wonderful hermitty weekend and that you enjoyed my finishes! I hope to finish some more next weekend...fingers crossed though since it's getting close to report time! Wow! Your Jane!!! Yay! You are so close to finishing! The over one verse isn't as bad as on other samplers since the verse isn't super big. :D And the squiggles at the ends of the lines are over two -- yay! The snake, I can't wait to see! I know you are planning on doing it the right way. :D Love your Coffee Bean finish and the two Autumn pieces too! Great finishing! Nice new stash too -- don't you love when the mailman brings you presents? You got so much accomplished! Look at all these pretties! Love your finished ornaments. I guess you are so close to finishing the sampler you can almost taste it.. like the coffee on the tree! Have fun with your new stash. Wow, you had great IHSW! Love your progress on Jane and those are such cute ornaments! Love that pumpkin and crow piece. Oh so close to another bigger finish. It looks great! Jane is almost finished! Wow. I can't help you with the gray linen. 123Stitch lists the approximate DMC color of the linen if that helps. Maybe a few others would do that for you if you called. Wow! You got so much done! Fantastic! Love all of your finishes. All your stitchings are lovely! I love all your finishes! I just want to get a cup of hot cocoa and snuggle under a blanket when I see them! Just what I needed to put me in the mood for our weather change. you are so very close on Jane, I can see a finish in your future! Jane is amazing. She looks like lots of work!! The ornaments are great! Great progress on Jane. Both of your ornaments are gorgeous. Have fun picking which ornaments to stitch from the JCS magazine. Jane is so sweet..very pretty.. 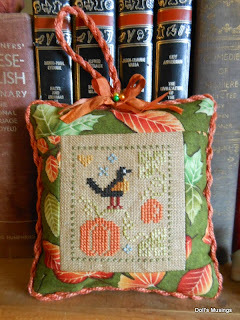 The ornaments are so sweet too..
A beautiful sampler, there's a lot of stitching in a piece that size. I'm sure you'll enjoy the Prairie Schooler, her work has a way of getting you hooked. Wow Anne! You are so close to a big big finish! Jane looks amazing. Your first PS chart? You will be addicted soon! I can't wait to see what ornament you choose to stitch. Hugs to you and Titus! How nice to see your sampler so close to being finished. Your finishes are ever so pretty too, congrats. Your finishes are lovely and the sampler is looking beautiful. Oh wow your Jane is stunning! Beautiful finishing. Love the PSS ornament. The PSS ornie is fab! I just got the JCS ornie issue too and started my first pick from it. Wow, you had a great weekend. Love your finishes - and Jane is SO close. Oh, you are on the homestretch with Jane!!! I know that you'll have it finished soon. Love your two ornaments and isn't it fun when the postman delivers presents!! Gorgeous finishes. I must get in the mood myself. Your Jane is looking good too. What will be your first stitch from the JCS mag? All of your projects are so cool and old fashioned looking! Your stitching itself is excellent, but I love the fabric choices you make for them, too- I think it adds a lot to the overall appearance, and is very spiffy. Congrats on all of the finishes, too, and the close-to-a-finish on your first project! Great progress on Jane. Congrats on the finishes. They turned out great. wow your stitching is beautiful! Gorgeous, gorgeous, GORGEOUS!! 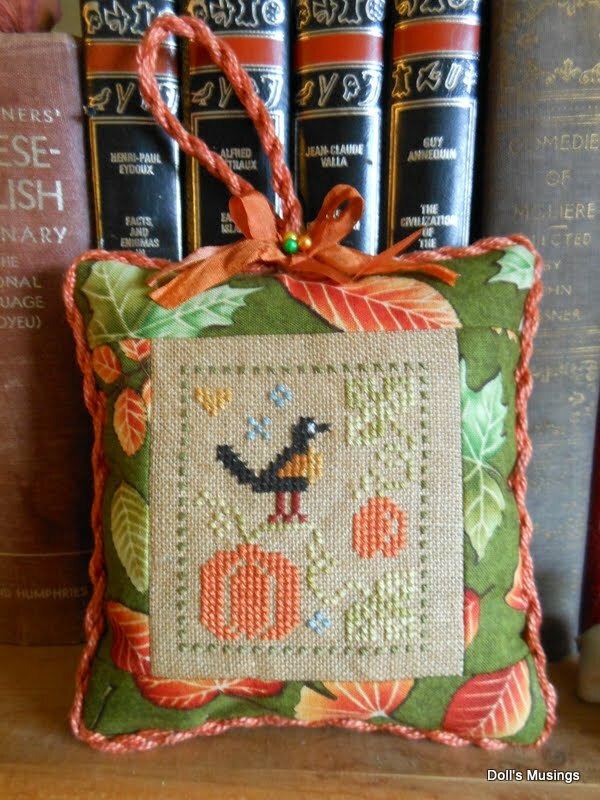 And I see you used your delightful fall leaves fabric and it looks so cute! 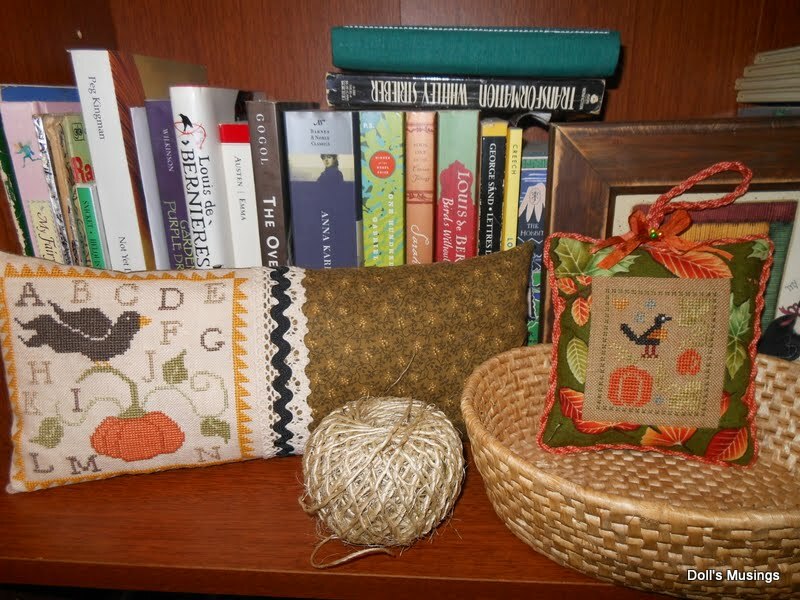 I think that basket needs, oh, five more little autumn pieces, yes~? Your ornaments are so lovely. And as for Jane? She is gorgeous. You've got to be feeling very happy coming close to finishing her. And for the grey fabric? I just dyed my own. You can see it on my blog if you like. I used Rit two colors and didn't leave it in long in the dye bath - like 20 seconds. Because I wanted it light. Came out great. let me know if I can be of any help. Sorry I have been away so long. Your sampler is coming along wonderfully. Love your little ornaments. Uau, Anne... your Jane is awesome.. I love it! Hey darlin'!! Finishes are too damn cute! GO GO GO on Jane!! Almost there!!! Holly Molly! That's a lot of finishes, I love them all!!! I can't wait to see which Christmas ornaments you stitch. Hope you have a relaxing and stitch-filled weekend, my friend! Bean' & 'Le Chalet' are wonderful, especially with your beautiful finishing....love the leaves fabric you ushed with 'Le Chalet'. Enjoy your JCS Christmas issue....there are lots of great ornaments to ponder stitching! Blessings for a lovely weekend! Your sampler is so beautiful. It will be breath taking when done and your small finishes are quite the beauty. Congrats on obtaining your first PS chart. I too am a big fan of that designer. She is a classic. I look forward to seeing some of your christmas ornies and possible dyed fabric. TFS and thanks for stopping by my blog. I appreciate it very much. Wow you're almost done Jane wow! Ahhh, Jane is nearly done, and she looks fabulous. And so do your smalls. These autumn pieces are so great, and so creatively finished. I just love them. I only stitch on Zweigart linen because it's so soft. I once used another brand, I think it was Wichelt, but I didn't like it because it was too stiff and too loosely woven. Zweigart has a colour called Confederate Gray but I think it's a bit blue-ish. I hope you'll find the colour you're looking for. I'm for the first time on your blog. I love your creations! Almost finished this gorgeous Jane! Thanks for letting us enjoy this wonderful job of stitching! Your Jane piece is looking fantastic! You must be so pleased that you are almost finished. The Coffee Bean Tree turned out very nice and I love how you finished your autumn pieces!! I recently purchased the Christmas issue as well but haven't decided yet which one to make as thare so many lovely ornaments to choose from! What a lovely post full of eye candy! Love Jane and you are so very close to finishing - wonderful. Your three little finishes are gorgeous. I especially love the Chalet de Perelles. The fabric and trim are just so perfect. I love your finishes! Your Prairie Schooler pattern is so cute. Love their designs. All of your work looks amazing!! I love that you had so many finishes - great job! Hi, Just found your blog via Stitching Dreams. Your sampler is amazing, it looks like an antique. Your finishes look so great!! Great finishes, they are beautiful! Love the finishing details you used.